When it comes to planning a special occasion it all starts with the invitation. No matter the celebration, just supply us with your custom designed invitation or you can have us design one for you. 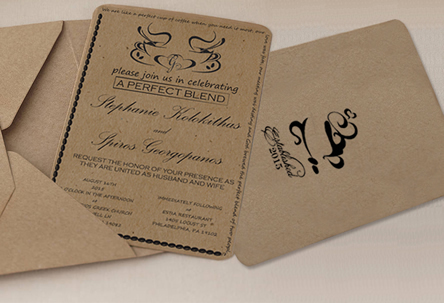 When you need to print invitations, we offer the sizes and stocks that are right for you. Standard turn time is 5-7 business days. "Brian and his team from Mirror Image deliver again! It started awhile ago when I needed my vision designed into a logo. They did such an unbelievable job, that I had business cards ordered from them. Brian took it up a notch when he designed custom bow-tie cards for me that everyone comments on. Most recently, I had the team create the covers for High School Musical production for our grade school. A++++, highly recommend!" Silk or Soft Touch paper, French Paper, Black or Brown Kraft Paper, recycled matte uncoated paper. Need blank envelopes or an RSVP card to accompany? Just ask us! We also offer, 1, 2 and 3 spot color printing as well as metallic inks like Silver and Gold.